Draw Lengths 24.5 - 30.5"
The TRIAX features new 3D Damping Technology that works to control the three perceived axes of vibration stemming from the grip. The design and location of the Enhanced Harmonic Stabilizer (EHS) diminishes all three paths of that residual vibration, drastically reducing post-shot noise and virtually eliminating felt recoil. This new location also transfers weight in front of and below the grip for a lower center of gravity, resulting in increased stability and easier aiming. I’ve been bow hunting for 6 years now love it and can’t get enough. I had a bowtech carbon overdrive for the last 4 years. 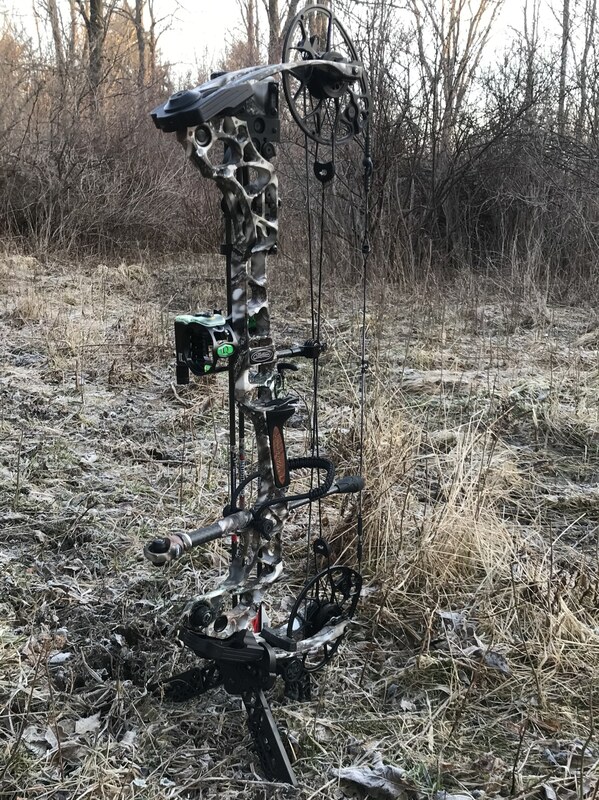 Was looking at upgrading this year and had shot the bowtech realm. I was impressed but had to stop at scheels for a pair of coveralls saw the triax. I was able to try it shot two arrows and was sold I absolutely love it. Will always for the future be a Mathews shooter. 5 out of 5	Absolutely Dead in the Hand! I have been shooting Hoyt for 23 years, but this bow has made me make the switch. It is so dead in the hand it’s unbelievable! I have officially made the switch to Mathews. 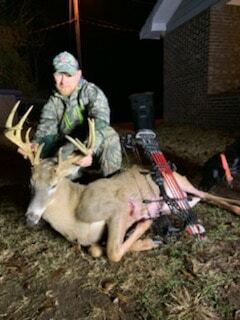 I have used my old McPherson compound bow for 27 years and loved it, but it was finally time to make the leap to a new bow. The Mathew’s Triax had the fancy parts that grabbed my attention. Interestingly my old McPherson bow came from the same lineage as the Mathews (Read about it here: https://www.huntinfool.com/articles/invited_guest/mathews/mathews.php). Now that I have had my Triax for 5 months, and done plenty of indoor and outdoor shoots, I’m confident to review the bow. It has a bit of an aggressive valley in the draw cycle, but that should be expected with such a cam set-up, and yet it’s very manageable. This bow is blazingly fast, but don’t be alarmed if your arrows don’t fly at the published IBO rating, my setup gets me in the 290 fps range. The Triax is quiet and “dead in the hand” (limited hand vibration) and it is a very accurate bow. Fit and finish is second to none, plus this is one impressive looking bow. If you’re looking for a great upper-end hunting bow, this is certainly one to consider. The short axle-to-axle height makes it easy to walk through the bush and yet it allows for a highly accurate arrow grouping. I’ve been pushing my shots out to 60 yards so far and getting fantastic grouping. Best thing to do is get out and try one at your local pro-shop, but be careful, you’ll likely walk out with a lighter wallet. Quick set up and easy to dial in. It is the quietest, smoothest drawing hunting bow I have ever shot. Quiet, Dead in the hand and fast. Just bought another one for 3D. 5 out of 5	Truly Great Bow!! This is my third Mathews bow and its the best bow I’ve ever owned. I absolutely love it’s look feel and of course how unbelievably quiet it is. I initiated it with a deer in it’s first hour of use. The let-off saved the day because I had to hold it at draw for a few minutes – and I had no problem doing so. What a pleasant surprise I had when I drew the bow for the first time. I was absolutely amazed at how smooth it was. I purchased this bow in December of 2017 soon after it was released and have shot literally thousands of arrows through it to date. I could not be happier with it’s performance. I shoot indoor target, winter and summer 3D leagues, and hunt of course and I have not shot more consistently and more accurately than ever before, and I have been drawing a string back since the early 90’s. 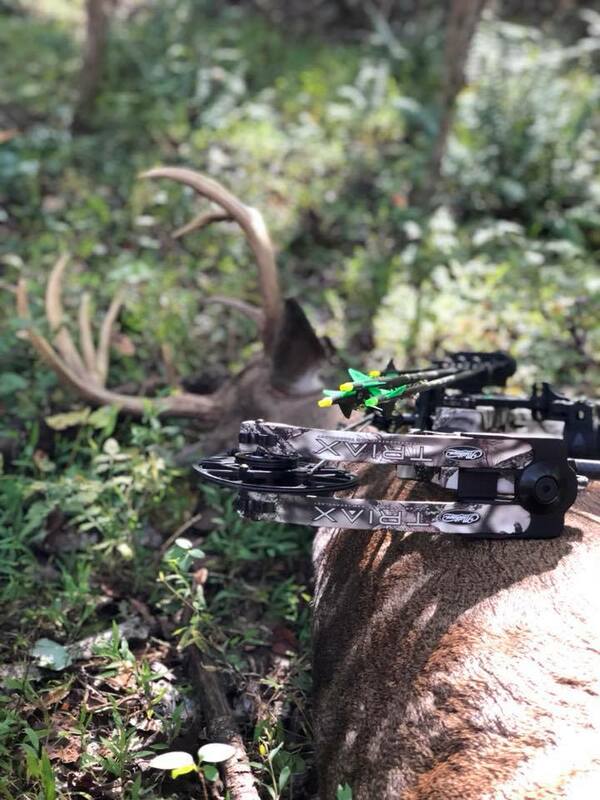 Coming directly from the Mathews HeliM which is a great bow and utilized the harmonic dampening technology as well, the team at Mathews really knock it out of the park with this one. My Triax is buttery smooth on the draw, unbelievably quiet and the vibration upon release is virtually nonexistent. Everything they tout in the Mathews promotional videos on this page is truly dead on. I have been taking part in the Total Archery Challenge which is basically 3D on steroids and has several shots over 100yards. This bow performs awesome on the stretched out shots. Many guys use a different bow for target shooting vs hunting. I use my Triax for both and recommend this bow to anyone looking for the best. Bravo Mathews! Love this bow. Very fast – super quiet – deadly accurate. I will be shooting this bow for many many years. I’ve owned every mathews bow in the last 5 years and the triax is no doubt the best bow I’ve ever shot. The lack of vibration is unreal. 5 out of 5	Awesome Bow! Hands down, the best bow I have ever held in my hand! Quiet, smooth, fast, and forgiving! Really loving this bow. Smooth draw, dead quiet release. Very accurate and compact too. Big game seasons from now on are going to be great! 5 out of 5	Why Buy Anything Else? Seriously so dead in the hand and quiet. I swear you will hear the arrow hit the target well before you hear anything or feel anything from the TRIAX. If you don’t believe me go shoot one for yourself. I would just like to say I am so proud to carry a Mathews Triax. Im not sure how y’all do it but its the most quiet, accurate and smoothest bow I’ve ever shot. Keep up the great work. Im team Mathews for life! I didn’t pick up a Mathews bow for almost 16 years, changing to a different brand after limb issues with my MQ1 in 2000. I shot the Triax this year and immediately purchased one in the spring in preparation for the fall whitetail season in my home state of Kentucky. This bow is a game changer and absolutely quiet. I can only imagine how much time went into the research and development of this bow. Thanks for delivering a quality product enhancing the outdoor experience.